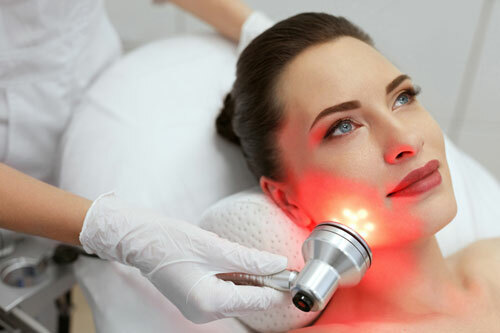 Another way to rejuvenate skin is with FDA approved LED Light Therapy. This therapy was developed by NASA in the 1980s to improve the healing of wounds and tissue growth in space. Light emitting diode (LED) technology uses 100% safe wavelengths of light to stimulate cells, increase circulation, and promote collagen growth. It has quickly become known as one of the most effective and non-invasive ways to aid in skin rejuvenation and repair. LED’s penetrate deep into the dermis layer of the skin, energizing the cells, stimulating collagen and elastin, giving the skin back its youthful look. SK Light – E Dermalife LED Therapy utilize Biological active light with zero heat effect. It can lighten spots, repair damaged skin, tighten pores and smooth out wrinkles. Red LED Therapy is to promote body’s metabolism, improve blood circulation and stimulate collagen to give skin radiance and whitening effect. Yellow LED Therapy with toning effect. Yellow Light stimulates the nervous and lymphatic systems, toning and strengthening the muscles under the epidermis, bringing tightness back to skin, aiding the anti-aging process. Green LED Therapy calm the skin. Green Light is found at the center of the visible spectrum, bringing balance and calm to the skin and reducing redness. The calming effect also has anti-inflammatory properties and can even help reduce hyper-pigmentation. Blue LED Therapy is used to destroy bacteria and reduce inflammation and treat acne problem.